LaBellaVida: DIY Sweet Tree - Cute Gift Idea! This is literally my third time trying to upload this post, how infuriating! Anyhow, hopefully it actually works this time! Right, so it was my baby sisters 21st (not so baby then..) last weekend and i wanted to give her a unique cute present that meant something to us both so what i eventually came up with was a flying saucer tree! My sisters fave sweetie is flying saucers so i decided those on a tree would look really really cute. I've seen a few of these online and decided that rather than pay in excess of £30 for one, i could definitely make one myself which would be all my own little touches and would mean more to my sister than one quickly bought online. Without going on and on, i think the tree went really well and i wanted to share a quick post on how i made it and the steps i took to make it look just as pretty as the ones you buy online! 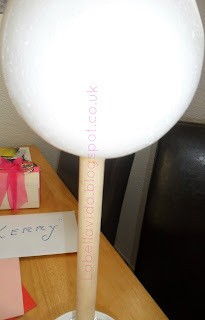 Polystyrene Ball - I used a 15cm one £2.99 from Hobbycraft. Cocktail Sticks - I needed loads of these and got them free from my work. Dowel Stick - I also got this free from work but you can cut a curtain pole or use bamboo stick. Sweets - I used flying saucers - around 300! A Pot or Tub - I used a garden pot i already had. 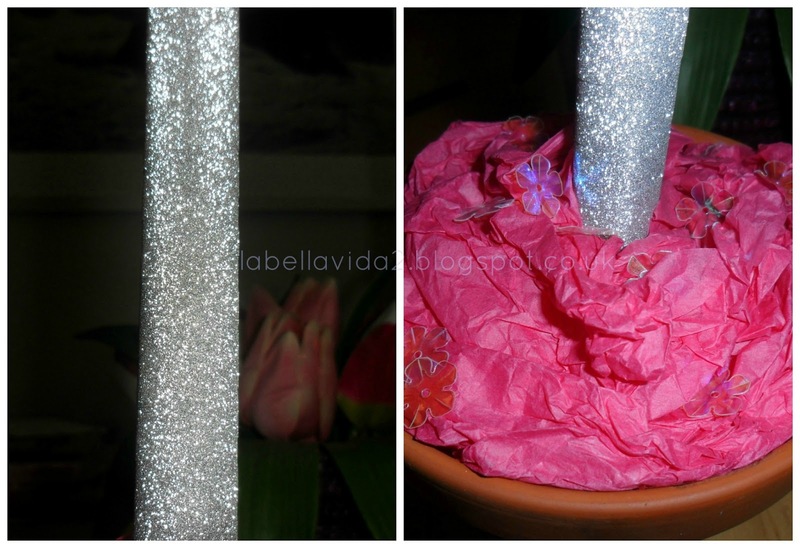 Plaster of Paris - If you don't have this you can use clay or playdough to pack the pole in. Firstly, i made a hole in the bottom of my ball and with some glue around the rim i pushed my stick into it and let that dry to attach the ball to the dowel pole. I then used plaster of paris to set my stick into my garden pot and let that dry overnight. The next stage is to choose a ribbon colour you want to cover your pole in. I chose a really pretty glittery one from Card Factory for £1.99. Basically to attach this all i done was put a little glue at the bottom of the pole and wrap all the way up to the top, cut the excess and glue at the top to secure. It doesn't even have to be very neat at the top of the bottom as it will pretty much be covered. I put some pretty pink tissue crumpled up in the pot and some flower confetti. Now your pole and pot look pretty but you need to get on with the ball! This stage is the most fidgety and time consuming although still mega easy. My boyfriend and i sat for ages attaching saucers to cocktail sticks then starting from the bottom of the ball sticking them all in one by one. As i got further up the ball however, i realised that it was actually easier (for me anyway) to stick the cocktail sticks in first, then attach the saucer. Some of the saucers split and some lost their sherbet but, that's ok, just means you get to eat them ;). Starting from the bottom makes it easier as if you leave that part until last you will find it difficult to go around the pole and fill all the spaces. A tip i would say is that the tree, in my opinion, looks prettier and bigger if you don't push the cocktail right into the ball, instead leave a little space between the sweet and the ball. Basically you just work all the way up the ball with the sweets until you can no longer see any of the ball. Then, when you reach the top you just go all the way around seeing if you can in-fill any spaces, then you're done! You can add any other decorative things you want to the pot/pole etc but i like mine the way it turned out and my sister loved it too! Hope you liked this little tutorial! Also, i'm having issues with my posts showing up on blogger and it's really starting to bug me! If you have any suggestions on how i can fix this annoyance pleassse please tell me how! I'm so impatient too but i just made myself finish it haha! Actually incredible, I so don't have the patience! 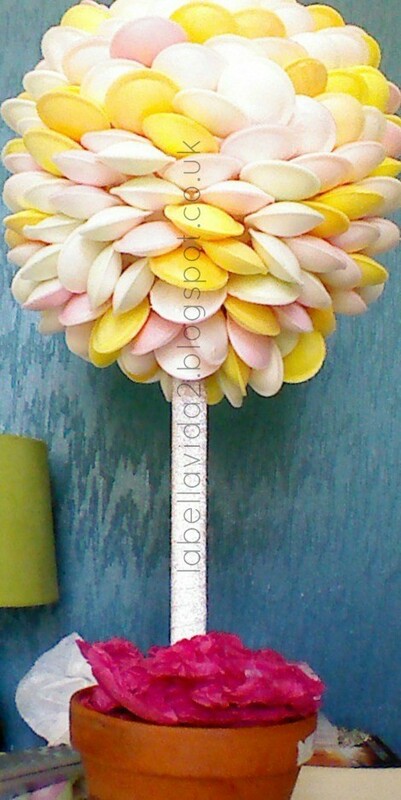 I really want to try with lollipops too, would be easier than attaching individual sweets to cocktail sticks haha! I know this post is old but i need some help when you attatch the flying saucers to the bottom of the ball how do u stop them from falling off? Nivea In-Shower Body Moisturiser Review!